Ola Strandberg’s line of ergonomically designed instruments extrapolate the design ideas seen in other ‘headless guitars’, and his innovations in neck profile design, CNC milling, materials, fanfret and tempered fretboards- as well as Creative Commons licensing much of his design work- make him one of the most exciting designers/builders today. 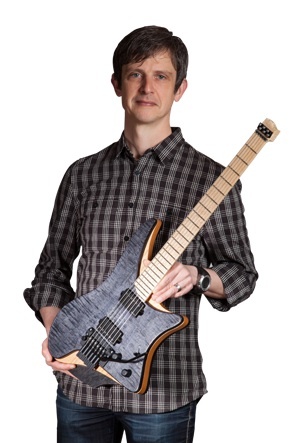 CTM & Parsons will be partnering exclusively with Strandberg in Spring 2014 in a collab course studying the ‘Radical Future of Guitar’. This lecture will be accompanied with a special guest appearance by guitarist Allan Marcus of ARECIBO. In 2013-14, CTM presents a series of lectures, workshops, & performances focusing on the cutting edge present and future of guitar and instrument design. Co-sponsored by Mannes School of Music, functioning as a platform to build cross divisional collaboration at The New School, and opening exclusive external collaborations, this series will bring internationally renowned luthiers, designers, builders, materials innovators, composers, performers, theorists, and sound designers together to explore points of connection between the traditions of musical instrument design and sound production, and new forms of design thinking facilitated by materials science, emergent materials, parametric design, the internet of things, physical computing, networked sound, and the politics of ‘noise’. Ken Parker, Ned Steinberger, Ola Strandberg, and Gary Lee. The Center for Tranformative Media at Parsons School of Design is a transdisciplinary media research initiative bridging design and the social sciences, and dedicated to the exploration of the transformative potential of emerging technologies upon the foundational practices of everyday life across a range of settings.